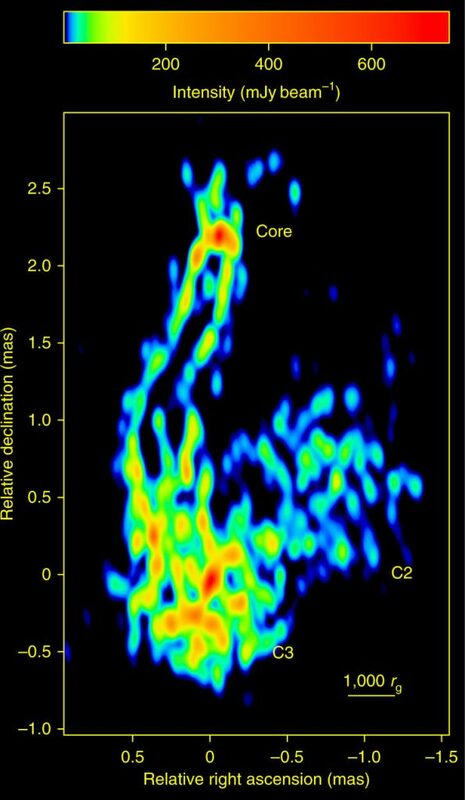 An international team of researchers has imaged newly forming jets of plasma from a massive black hole with unprecedented accuracy. Radio images made with a combination of telescopes in space and on the ground resolve the jet structure merely a couple of hundred black hole radii or 12 light days from its launching site. At the centers of all massive galaxies are black holes weighing as much as several billion times the mass of our sun. It has been known for long that some of these massive black holes eject spectacular plasma jets at a near speed-of-light that can extend far beyond the confines of their host galaxy. But how these jets form in the first place has been a long-standing mystery. One of the main difficulties in studying them has been astronomers’ inability to image the structure of the jets driven by the black hole close enough to their launching site so that direct comparison to theoretical and computational models of jet formation would be possible. Now an international team of researchers from eight different countries has made ultra-high angular resolution images of the black hole jet at the center of the giant galaxy NGC 1275, also known as radio source Perseus A or 3C 84. The researchers were able to resolve the jet structure ten times closer to the black hole in NGC 1275 than what has been possible before with ground-based instruments, revealing unprecedented details of the jet formation region. “The results were surprising. It turned out that the observed width of the jet was significantly wider than what was expected in the currently favoured models where the jet is launched from the black hole’s ergosphere – an area of space right next to a spinning black hole where space itself is dragged to a circling motion around the hole,” explains Professor Gabriele Giovannini from Italian National Institute for Astrophysics, the lead author of the paper published in Nature Astronomy. “This may imply that at least the outer part of the jet is launched from the accretion disk surrounding the black hole. Our result does not yet falsify the current models where the jets are launched from the ergosphere, but we hope it will give the theorists an insight into the jet structure close to the launching site and clues about how to develop the models,” adds Dr. Tuomas Savolainen from Aalto University in Finland, head of the RadioAstron observing program which produced the images. Another result from the study is that the jet structure in NGC 1275 significantly differs from the jet in the very nearby galaxy Messier 87, which is the only other jet whose structure has been imaged equally close to the black hole. Researchers think that this is due to the difference in the age of these two jets. “The jet in NGC 1275 was re-started just over a decade ago and is currently still forming, which provides a unique opportunity to follow the very early growth of a black hole jet. Continuing these observations will be very important,” explains a co-author of the paper, Dr. Masanori Nakamura from Academia Sinica in Taiwan. “This study of the innermost region of NGC 1275 continues our investigations of Active Galactic Nuclei at the highest possible resolution. As the distance to that galaxy is only 70 Megaparsec or 230 million light years, we are able to examine the jet structure with an unprecedented accuracy of only a few hundred black hole radii or 12 light days,” concludes Professor Anton Zensus, director at the Max Planck Institute for Radio Astronomy in Bonn, Germany and head of its VLBI research department, a co-author of the paper. 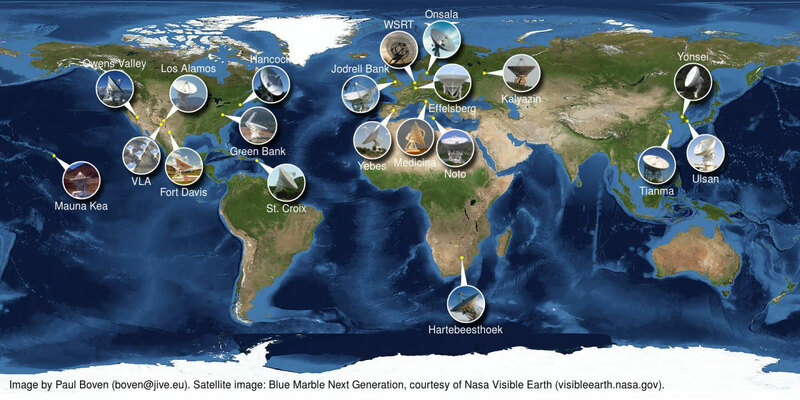 Part of the global network of ground radio telescopes that participated in the observations. Credit: Paul Boven ([email protected]). Satellite image: Blue Marble Next Generation, courtesy of NASA Visible Earth (visibleearth.nasa.gov). 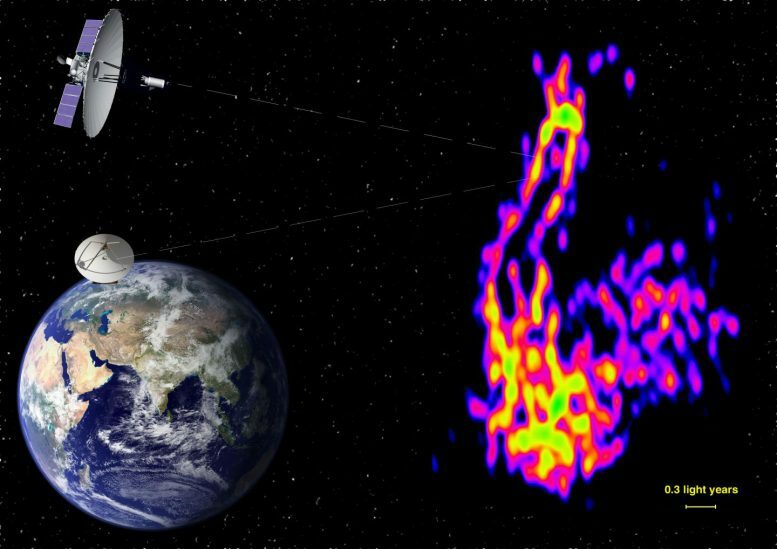 The significant improvement in the sharpness of the jet images was made possible by the Earth-to-Space Interferometer RadioAstron, which consists of a 10-metre orbiting radio telescope and a collection of about two dozen of the world’s largest ground-based radio telescopes. When the signals of individual telescopes are combined using the interference of radio waves, this array of telescopes has the angular resolution equivalent to a radio telescope of 350,000 km in diameter – almost the distance between the Earth and Moon. This makes RadioAstron the highest angular resolution instrument in the history of astronomy. The RadioAstron project is led by the Astro Space Center of the Lebedev Physical Institute of the Russian Academy of Sciences and the Lavochkin Scientific and Production Association under a contract with the State Space Corporation ROSCOSMOS, in collaboration with partner organizations in Russia and other countries. 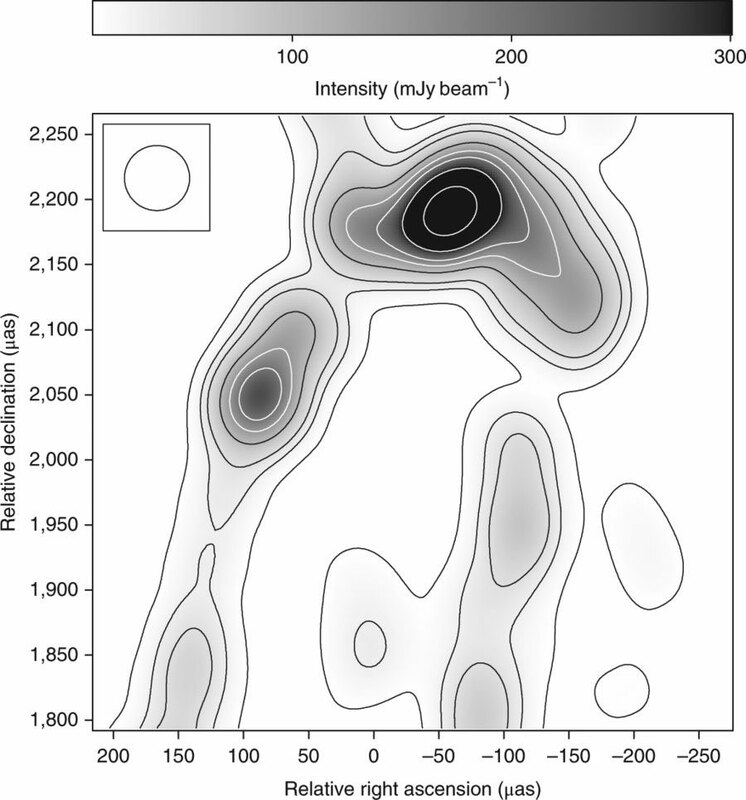 “We at the RadioAstron mission are truly happy that the unique combination of the Russian-made space radio telescope and the huge international ground array of the largest radio telescopes has allowed to study this young relativistic jet in the immediate vicinity of the supermassive black hole,” comments the RadioAstron Project Scientist, Professor Yuri Kovalev from the Lebedev Institute in Moscow. Be the first to comment on "Astronomers View Black Hole Jets Deep Inside Perseus A"